So yesterday’s Movember was a blast. I thought I managed 8 of 10 Rx but today realized I scales 3 WODs. The below picture was the starting list. Starting at 15:00 we had a 20 minute time cap and 30 minutes between starts. So the faster you finished the more rest you got. Tomorrow is a big day of sorts. No, nothing to do with triathlon, but 10 WoDs in 5 hours. Keeping in theme with Movember, we will do 10 “girls” starting every 30 minutes with some fun and rest between each one. I am not sure of the order, but below are the 10 “girls” we plan on doing. Yesterday after work I made my way to the Box, while the girls were at dance and swimming. Luckily for me Martin showed up and was willing to workout with me. So after a short warm up we got started on WoD 4. Last weekend I spent most of my time at the pool. Not for myself, but as a race official Saturday and starter on Sunday. Lily was in the pool. So much fun watching kids race. From one meet to the next they can cut seconds from their times, not tenths like older kids and grown-ups. After two long days at the pool, I made my way to the box to test Everyday Warrior WoD 3. So they had problems with registering scores from WoD 1 and extended them through Sunday. With a five day trip coming up I decided to give both 1 & 2 another try. So Thursday afternoon I make my way to Crossfit Växjö. So now that all of the results have been finalize for the second time here comes some data from the Lift-off. I did better than I thought, but still I have alot of room for improvement. With 3 weeks left in the Everyday Warrior I am hoping that I finish better than 80%. So Friday evening, nine friends got together at the box for some old fashion fun. 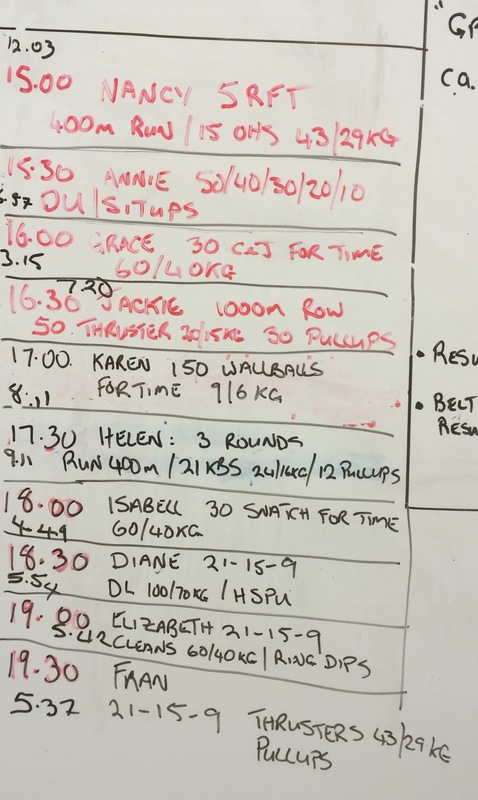 Before we even started I decided to scale Diane to 80kg and Karen to 6kg instead of 9kg. Saturday the 31st of October I particpated in Simma24, a 24 hour swim to help raise money for Doctors Without Borders. I was not alone in this swim. There were 57 starting the day, including 3 relay times. Then we even had some people who could manage the 1600 m/hour concept, but did what they could for example 800 m/hour for 24 hours. All in all there 85 swimmers that contributed to 650 miles (1600m) –> An Amazing 1,040,000 m!! !